is all you need to live a contented life. 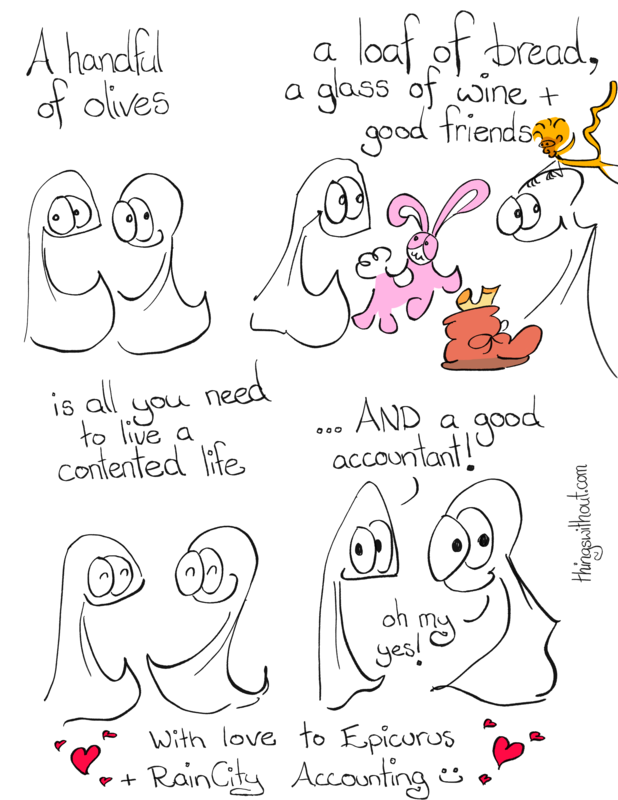 Thing 1: AND a good accountant! Thing 2: oh my yes! With love to Epicurus and RainCity Accounting. For the longest time I thought this was an Epicurus quote. Then I realized I was quoting an Australian philosopher I heard on the radio once! It was a wonderful interview and this philosopher’s words beautifully summarized everything I love about Epicurus. Epicurus is my favorite Greek philosopher. He taught women as well as men. He encouraged scientific curiousity. I love how he defined pleasure, happiness and living a good life. He loved friendship as one of the highest values and highest pleasures. RainCity Accounting contribute to the katastematic and kinetic pleasure in our house (removal of pain and pleasure of action). Jordie inspired this comic after answering a late night e-mail :-). He definitely helped me brave enough to navigate having a small business in the USA. Thanks to all the wonderful friends of the Things. The ones we‘ve met and the ones we haven’t. You are truly a great pleasure. Knowing you’re out there encourages us to kinetic and katastematic pleasures (aka the joy of doing and action and the reduction of pain that comes from contributing with purpose).